Last year, Fort Valley State University faculty earned national prominence for their scholastic research and academic contributions. U. S. Secretary of Agriculture, Tom Vilsack, appointed FVSU College of Agriculture, Family Sciences and Technology dean, Dr. GovindKannan, to the National Agricultural Research, Extension, Education, and Economics Advisory Board. Kannan will serve a two-year term on the board from 2014 until 2016. Dr. Meigan Fields, founding director of FVSU’s Honor’s Program, was selected to serve on the National Collegiate Honors Council’s Small College Honors Committee. The committee serves four-year institutions with a size of less than 4,001 undergraduates or a program size of fewer than 76 students. Another professor, Juone Brown, director of the university’s Women’s Center, was voted as the president for the University System of Georgia’s Faculty Council, an advisory body that represents its 31 member institutions. Brown is the first FVSU professor elected to be elected to this post. FVSU professors and administrators were recognized for their mentoring efforts by two national organizations. The Geological Society of America, a professional group that provides resources to earth scientists, named Dr. Isaac Crumbly, associate vice president of collaborative programs and CDEP director, with its 2014 Bromery Award. The honor is given to minorities that have made significant contributions to research in the geological sciences. Dr. Fred McLaughlin, a professor of biology, received the National Role Model Faculty Award from the Minority Access Inc. for his work to help STEM students succeed on campus. FVSU also had two Fulbright professors that made headlines during 2014. 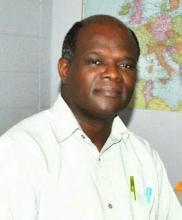 The Southeastern Branch of the Entomological Society of America awarded FVSU Dr. George Mbata, FVSU’s biology chair and a Fulbright professor, with its Distinguished Achievement Award in Teaching during its 2014 Annual Conference. Mbata and Dr. Dwayne Daniels, chair of FVSU’s chemistry department, traveled to Nigeria in March 2014, to lecture at the Federal University of Technology of Akure. Another professor, Dr. Peter Dumbuya, was awarded a Fulbright grant to travel abroad to the West African country of Sierra Leone. There, the professor conducted research on the effects of the nation’s brutal 11 year civil war (that started in 1991) on its children and women. In campus political news, Dr. James Mack, a professor of chemistry, was elected as the new president for faculty senate. He will serve a two-year term until 2016.